The bass-heads amongst you may well have heard of Jeff Schmidt – he’s a solo bassist from the States, and has just released his debut album, Outre. It’s a lovely record, most of it on piccolo bass in a similar ball-park to Michael Manring and Trip Wamsley, with a fair amount of influence from the nu-acoustic guitar crowd – Don Ross, Michael Hedges, Preston Reid etc. Jeff’s also a regular at the masterclass that I give in Northern California each year in January, but the reason I’m blogging about it – other than it being a lovely album that you should hear – is that he’s previewing it via a Podcast which you can subscribe to here for free – Jeff’s pretty good at dissecting what he does and why, so the podcast will make for interesting listening for any musician, not just bassists (he doesn’t sound much like a bassist anyway… ;o) You can find the podcast on iTunes as well, just do a search on ‘jeff schmidt’. I’m officially on my way home, sat in San Francisco airport, waiting for my flight. The last few days have been fantastic – catching up with friends around the bay area, and then Saturday’s masterclass and gig. Then it was out to see another friend’s band play – a rock/metal covers band called Mr Meanor – great players, who’ve clearly put a heck of a lot of time, energy and skill into what they do – it’s great to see a bar band that plays with such conviction. The weird thing was how few of the songs I knew – the US and UK rock charts in the 70s and 80s were clearly very different! Onto Saturday – It’s the third time I’ve taught a masterclass here, and the biggest so far – I set a limit of 20 people and we had 20 people, which was good – two long sessions of almost three hours each with an hour off for lunch and trying eachother’s basses etc. it was, as is my usual teaching approach, a lot more about the mental approach to playing than it was about ‘licks to play over a D minor chord’ – I probably only played for about 15 minutes total in the class, but spent most of the time answering questions, and dealing with a lot of the misconceptions that we’ve all grown up with about the music making process. the feedback thus far from the people who came along has been great, and hopefully the discussions will continue on the forum. From the masterclass, we headed over to the espresso garden – this was my fifth gig at the Espresso Garden, and possibly, sadly, my last, as the venue is being sold, but doesn’t have a buyer as yet. It’s a great venue that has hosted gigs by some of my favourite musicians – John Lester, Kris Delmhorst, Muriel Anderson, Martyn Joseph – a great listening room for acoustic music. It’s the fourth time that Michael and I had played there together, and the second time that we filled it, which felt good. We also had Jeff Schmidt along with us, who played a lovely opening set, and joined us for a cool improv at the end of the gig. I think the most startling thing about the gig was Michael’s sound – due to the logistics of the gig, he had Mark Wright from Accugroove bring him a couple of speakers to use, which meant that all three of us were going through Accugroove stereo rigs – I’ve NEVER heard Michael’s bass sound that clear or focussed. It was incredible. It was also a lot of fun for me to be using the Looperlative on a solo gig – it’s the first time I’ve done it, and it sounded great – I even tried a version of ‘Despite My Worst Intentions’, which I’ve never played with that box (and it has some pretty complex looping stuff going on with it) and it worked a treat, it made sense, and felt good. All in, a marvellous day! Yesterday was another magical day – the morning spent with Mark Wright, the afternoon with Michael Manring, the early evening teaching a great bassist called Arianne Cap, then dinner with Arianne, her husband Wolfgang, and with Jeff Schmidt and his wife Valerie, followed by late evening with Anderson Page from Modulus and his wife Laura – a day chock full of encounters with fantastic inspiring lovely friends. California is like that for me – I get to see so many great people, who energise me, inspire me musically, politically, spiritually… I really don’t think I could ever live out here (maybe that’ll change), but some of my favourite people in the whole world are here. Thanks to all of you for what you feed into my life. 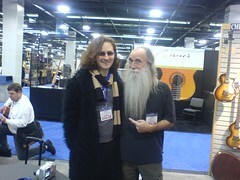 So what have I missed from NAMM? Well, I posted about Thursday night – that was fun. Friday – er, can’t remember much about during the day, other than doing some Looperlative demos, and playing on the Accugroove stand. Oh, and did a set at Modulus as well, though where Modulus is stationed, it’s all but impossible to play anything due to them being flanked by hair-metal amp companies and opposite the Taylor booth who have a stage set up with acoustic bands playing all the time. Accugroove and Looperlative are both down in Hall E where the noise level is much lower, so more people could stop and listen to what’s being played. And on both those stands I had AccuGroove speakers to play through, which made all the difference. I just don’t like using regular bass amps any more. The only bass cabinet company that comes close to AccuGroove is Glokenklang – they make some really lovely uncoloured speaker cabs. Great stuff. Anyway, what else? Ah, Friday evening, Sabian had a big show, featuring some celeb drummers – Dave Weckl, Terry Bozzio and Joey Heredia. Terry being the interest, not just because he’s already more interesting than the others, but because he had the wonderful Doug Lunn on bass. Doug’s one of my closest american friends, and him playing also meant that his wife Vida was at the show on Friday, so we had lunch – that’s what NAMM’s pretty much all about for me, catching up with the lovely people here that I only get to see once a year. So we wandered outside, and hung out, chatted, laughed a lot – all good. Back inside for the Bozzio band, which was a whole different proposition. Some seriously dark, difficult music, that owed more to Pierre Boulez or Edgar Varese than to the usual guitar trio reference points. Alex Machacacek who wrote most of the material is a remarkable guitarist, writing incredibly dense structured music, with multiple time and tempo changes each bar. Scary stuff. Doug acquitted himself admirably, playing this scary mathematical music with a serious amount of groove and flair. Saturday at NAMM is mayhem – way too many people there, lots of celebs showing up (eg Gene Simmons shows up with film crew in tow – I saw him there up close last year and he looks like a pile of offal from a butchers floor that someone has mushed together and re-animated. Not a good advert for ‘rock ‘n’ roll’ living.) So I stayed down in Hall E for a lot of the time, and escaped over to Subway for lunch. Didn’t even think about playing on the Modulus booth, but did a fair amount of stuff down at Looperlative, including some fun duets with Tal Wilkenfeld – a fab Australian bassist living in NYC – I blogged about seeing her play last year. Saturday night at NAMM means ‘Muriel Anderson’s All Star Guitar Night’ – one of the best gigs of the show. Sadly this year, I missed a lot of it due to heading up to Hollywood to see Bozzio’s trio again at the Baked Potato. But not before I’d gone in to meet Patti Larkin – Patti’s a huge favourite of mine, a stunning singer/songwriter who has worked a lot with Michael Manring over the years and I’ve been wanting to meet for years. A few connections were used, and I got a chance to say hello and briefly discuss the possibility of her coming over to play in the UK – that’d be great! then off up to Hollywood for more Bozzio/Lunn/Machacek craziness. top stuff, but a very late drive back to Bob and Alison’s in Costa Mesa. And then Sunday – the quiet day, I arrived late at the show, and left early, but not before filming the Looperlative demo and saying goodbye to some lovely friends for another year. And I headed off into Hollywood again to see another old friend, Tanya, who I’d not seen for three years, feeling dried out and exhausted (me, not Tanni) by four days of vicious air conditioning and walking miles. Soundtrack – in the car here, I’ve been listening to lots of music by friends of mine, to keep me from feeling homesick – Juliet Turner, BJ Cole, Mark Lockheart, Thomas Leeb… it works.